Welcome to the snakepit! This is the home page of the Rattlers and Firebirds of Company A/501st Aviation Battalion, 71st Assault Helicopter Company, 151st Transportation Detachment, and the 94th Signal Detachment. 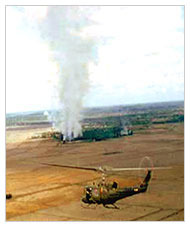 We served in Vietnam from 1964 until 1971, moving from our original base at Bien Hoa to Chu Lai in 1967. The radio call signs “Rattler” and “Firebird” were used by our aircraft during our service in Vietnam. “Rattler” was used by our UH-1D & H helicopters (known as "slicks") that carried troops, supplies, ammunition, performed command and control, combat assault, medical evacuation and insertion/extraction missions, as well as many others. The call sign “Firebird” was used by our UH-1B, C & M gunships, some of the most feared gunships in all of Vietnam. You can find more about the call signs and where they came from on our history page. Added preliminary information about the 2020 Reunion to the Reunions Section. Added the November 2018 Newsletter to the Newsletters Section. Our new phone number is: 903-848-9033.